On Tuesday, October 11, 2016, I stepped into Boardwalk Chevrolet and sat down with Don Mays to order my own Chevrolet Bolt. This very specific step is the beginning of my second electric car adventure, one that I expect to change the way I write about cars. Ever since I heard about the Bolt–GM’s 200+ mile all-electric car–I’ve been fascinated with it, and followed all the news reports on it closely. Also, over time, I’ve become convinced that electric cars are a major part of our future transportation solution for working to limit the effects of climate change. From January to April of this year, I spent a delightful three months with a darling baby blue Fiat 500e, which I named Fidelio. He and I commuted and dashed about town together without using a drop of gas, and it was a very happy experience. However, Fidelio’s 90-mile range was the one down side. So, when I learned that the Bolt would offer more than 200 miles, I was sold. Don tells me that the order will be placed, and that, as production moves along, he’ll be able to tell me when my car is made and track its progress from the Orion, Michigan plant to Milpitas, CA. Then, it will go onto a truck and be sent to the dealership in Redwood City, CA. Expected arrival? Around Christmas time, if I’m lucky. But it sounds like the West Coast gets the first allocations, and that’s where I live. I’ve ordered cars before, but never without test driving one. I was one of the first Saturn owners, back in November of 1990. My family also bought one of the first Corvairs, in 1960. So I guess it’s a family tradition to try out new GM experiments. By the way, I ordered my car as the upper level Premier, in extra-cost Kinetic Blue, with the lighter of two interior colors (gray/white), with the premium audio package (I’ll spend a lot of time commuting in it), and the safety feature package as well. I got the quick charge plug, too. May as well have it the way I want it, and I expect to be showing it off a lot–especially when it’s the first one in town. 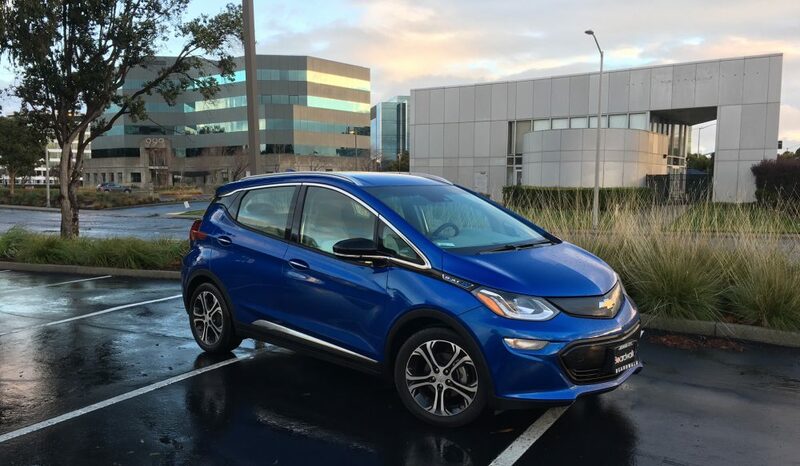 This entry was posted in cars, Chevrolet Bolt, climate change, global warming, green cars, Uncategorized and tagged cars, Chevrolet Bolt, Chevy Bolt, climate change, electric cars, electrics, global warming by stevegoesgreen. Bookmark the permalink.